Even though I had never had a pet, I knew when I retired that I wanted to adopt a Golden rescue. When I brought Riley home, I knew at some point she would lose all remaining vision in her “good” eye. Less than 48 hours after we became a family, Riley’s sighted eye flared up and Riley became best friends with her new vet. But after 15 days of constant pain, enough was enough. 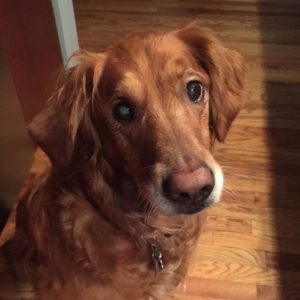 Consulting with Riley’s previous eye specialist, we decided it was best for Riley to give up her remaining vision and become a blind dog. Riley has no problem finding a private space for a nap or a toy she wants. Riley will need ointment in both eyes for the rest of her life and she graciously submits to having her eyes “done”. We make a great team working in the yard – as long as my breaks are her time. Riley is my forever friend.